Pluredro blog: Mirii CFT now on sale! Puzzles and educational toys designed and made by Junichi Yananose. Mirii CFT now on sale! 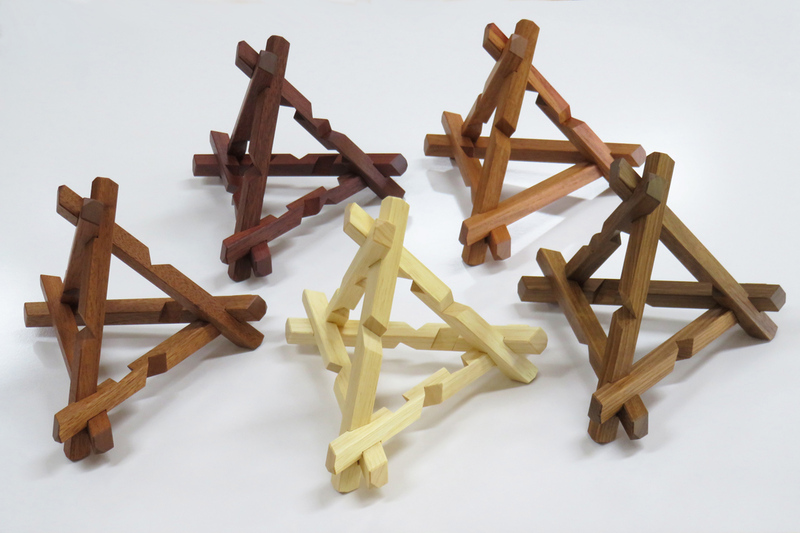 We have started selling our new puzzle "Mirii CFT." The word "Mirii" is an Aboriginal word and it means star. CTF stands for compound of five tetrahedra and it describes the shape of this puzzle. Every different shape of piece form five tetrahedra, and when they are all assembled it will form the shape of a star-shaped polyhedron. Mirii CFT is a very difficult puzzle to solve. Every piece has a similar shape and even if you assemble it seeing the solution, you may mix up pieces. 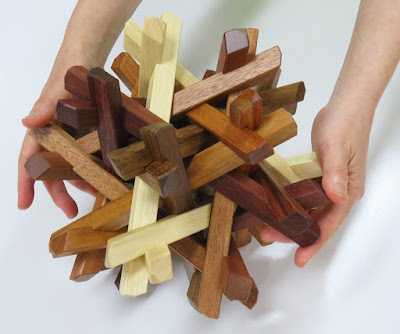 Juno who designed the puzzle says that he remembered the solution of Mirii CFT after he assembled about five of them, but once he forgets the solution it would be impossible to assemble it without seeing the solution. The timber which were used for Mirii CFT were Koto, Blackbean, Queensland Maple (citrus family tree), Jarrah and PNG Rosewood. The length of the piece is 240mm (0.945in), a cross section is a square of 18mm x 18mm (0.71in x 0.71in). 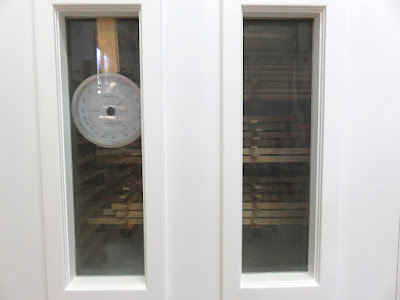 Juno processed every timber to form 19mm x 19mm (0.75in x 0.75in) cross sections and dried them at the DIY kiln. He left them inside our workplace and after he acclimatized them, he put them through the thicknesser and made them the target sizes. The edges of the pieces are all arrised. Juno machined very carefully but there were lots of difficulties and he lost many pieces during the operations. Ultimately, we have finished making 15 Mirii CFT, we will keep one for ourselves so there are 14 Mirii CFT which can be sold. Maybe he won't make this puzzle in the future again, so this is the first time and the last time to sell. I personally think Mirii CFT looks gorgeous with its five different coloured timber. 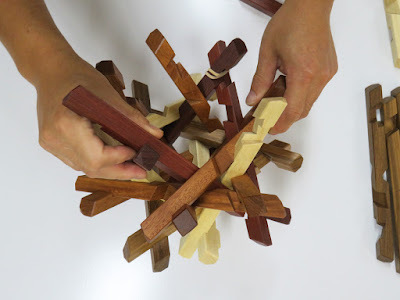 I hope puzzle lovers will love this complicated and beautiful timber puzzle. This is a shared account of Junichi and Yukari. We design, produce and sell original mechanical puzzles.